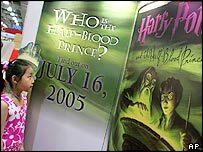 Stringent measures to block plot revelations from Harry Potter book six have been in place since JK Rowling put down her pen, despite a flurry of betting and a court case over allegedly stolen copies. 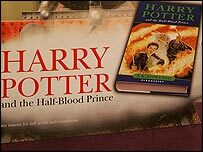 All retailers worldwide have had to sign an embargo letter agreeing not to sell the sixth Harry Potter book, Harry Potter and the Half-Blood Prince, before 0001 BST on Saturday. Publisher Bloomsbury has also taken out a "John Doe" injunction - a legal order against an as yet unnamed defendant, routinely used in the US - to stop anyone disclosing information about its contents. The publisher issued the same injunction in 2003 after Donald Parfitt - a forklift trucker at Clays Printers in Suffolk - tried to sell pages from the fifth Potter book to the Sun newspaper. Parfitt was subsequently convicted of theft. Not even book jacket illustrator Jason Cockcroft has been allowed to read the novel. "Apart from JK Rowling, there's only about two people I think who have read the book so far," he said. "All I know is I was asked to draw Harry and Dumbledore looking very apprehensive as something comes towards them," he added. "I've been given a few snippets of information just to help me with the cover. "I'm glad I don't know more because I don't think I could handle the responsibility." A Bloomsbury spokeswoman would not go into specifics but admitted the publisher had increased its preventative measures with each new Potter book. "People have become increasingly desperate to get their hands on a copy, so we have had to increase our security accordingly," she said. However, there was a limit, she said. "You do everything you can, but if someone decides to do something dodgy there's only so much you can do." In May, bets that Harry's mentor Dumbledore would die in book six were suspended after a flurry of wagers aroused suspicion of a possible leak. The majority of bets came from Bungay, coincidentally the Suffolk town of the books' regular printers. Security concerns were raised in June when two men were arrested after allegedly trying to sell stolen copies of the novel to the Sun and the Daily Mirror newspapers. Aaron Lambert, 19, from Kettering, Northamptonshire, is to face trial charged with taking the books and possession of an imitation firearm with intent to cause fear of violence, both of which he denies. Christopher Brown, 37, also from Kettering, is on bail charged with one count of handling the stolen books and one of possession of an offensive weapon. He also denies the charges. Booksellers are playing by the publishers' rules - no doubt aware that any infractions may impact upon plans to sell the final Potter book in a few years' time. "The risk is enough to terrify any retailer," said Waterstone's buyer Sam Harrison, who claims his company will only receive their copies a few hours before the midnight launch. "None of our employees will look at the book before it goes on sale," he told the BBC News website. "The books will be in sealed boxes placed under lock and key. We've had to sign an embargo saying those boxes will not be opened until midnight." However, Mr Harrison says he does not feel the measures are excessive. "It all adds to the sense of mystery and excitement," he said. "It makes it more special for children and contributes to the sense of occasion." Online retailer Amazon.co.uk, which has received more than 200,000 orders in the UK, has put "strict security measures" in place. 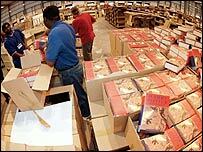 Its copies have been stored in a secure, 180,000 square foot warehouse at an undisclosed location, ready to send out to customers on the day of release. "We've been planning this for a long time," a spokeswoman told the BBC News website. Legal actions notwithstanding, such heightened security only feeds the anticipation that surrounds a new Potter. Even Bloomsbury's competitors admit that can only be a good thing. "I don't feel any animosity towards them whatsoever," said Mike Richards of Egmont Press, UK publishers of the Lemony Snicket series. "JK Rowling has thrown a real spotlight onto children's books, and I truly believe that there has never been a better time for children's fiction." Paul Waller, owner of the Bags of Books shop in Lewes, Sussex, says he has no problem abiding by an embargo that puts him on the same footing as his competitors. "It's just an extra bit of paperwork," he said. "It's not too irksome and all part of the fun." Bookstores in central London, meanwhile, will have their own security in place in the wake of Thursday's bomb blasts in the capital. Large crowds are expected at Waterstone's Oxford Street branch, where organisers say its launch party will go ahead as planned. "Prior to the dreadful events of last week we had already booked security and police to be present at the midnight opening," said a spokeswoman for the chain.